You have to be pretty charming to convince David Sedaris to let you turn one of his stories into a movie. But that’s precisely the quality that allowed filmmaker Kyle Patrick Alvarez to adapt the short story C.O.G. into a terrific film starring Jonathan Groff. Kyle’s our guest this week along with L.A. Weekly food writer Tien Nguyen, who not only helps compose the annual Best of L.A. issue but also just co-authored a cookbook with celebrated chef Roy Choi. 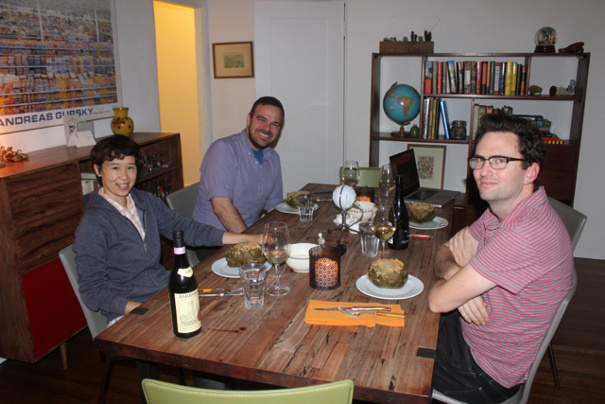 Here’s a picture of everyone at the table with their artichokes. * Vietnamese food—what other dishes are there besides pho? * The film industry and the food industry. * How Kyle charmed David Sedaris into letting him do this movie. * Tien’s collaboration on the Roy Choi cookbook. * Kyle’s relationship with McDonald’s (his dad was a McDonald’s executive) and how/if that’s linked to his vegetarianism. Thanks Tien and Kyle for being such great guests! The podcast is also available on iTunes here. Feel free to review it: I’d sure appreciate it.